Our range of products include cervical traction set pulley, pelvic traction set and skin traction set. 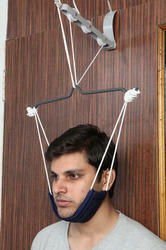 We are actively engaged in offering a wide gamut of Cervical Traction Set Pulley. This array is designed to offer traction to the cervical and upper dorsal vertebras. It reduces pressure by stretching the musculature and connective tissue components of the cervical spine. Offered product is designed using the advanced machine with set universal standards. This range is quality checked on well-defined parameters. To meet diverse requirements of our clients in the best possible manner, we are offering Pelvic Traction Set. This traction set is intended to apply uniform and controlled traction to the sacral, lumbar and thoracic areas of the vertebral column. Offered traction set is designed by our veteran professionals using an advanced machine to deliver utmost clients' satisfaction. Backed by a team of skilled professionals, we are occupied in offering a qualitative range of Skin Traction Set. Offered traction set is used for providing indirect traction to the arm and leg to reduce skeletal deformities, fractures, muscle contractures, pressure on nerves or regain normal length, muscle spasms, and alignment of involved bone. This traction set can be easily put on & off. This traction set is designed using a modern machine in tune with the set industry norms.